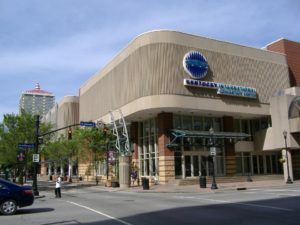 The Kentucky International Convention Center (formerly called the Commonwealth Convention Center) was built in 1977 in downtown Louisville, Kentucky. The 960,000-square-foot facility underwent a two-year, $207 million transformation ahead of its grand reopening on August 6, 2018. 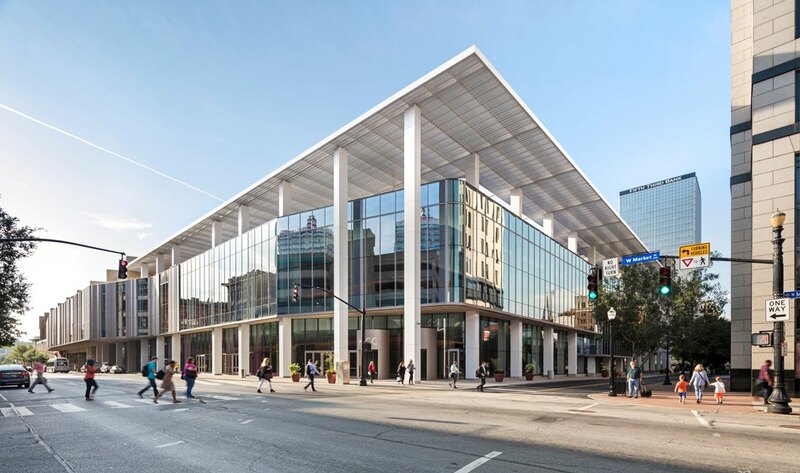 The renovated Kentucky International Convention Center (KICC) was redesigned by Kentucky-based architecture firm EOP, and by HOK’s Chicago practice, in collaboration with convention center specialist Donald Grinberg, FAIA. 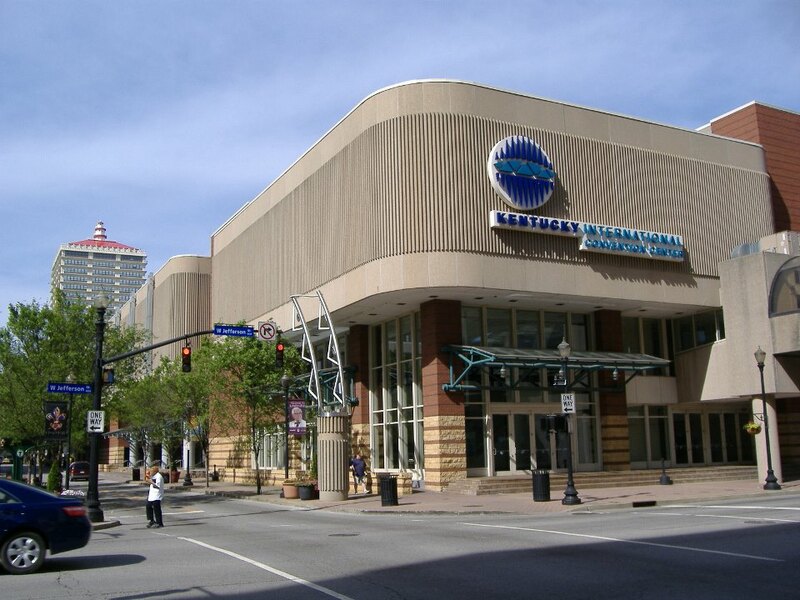 KICC prior to redesign and renovation. Photo by Bedford via Wikipedia. “Convention centers tend to be introverted building typologies, buildings that are inwardly focused and turning away from the city. For KICC, we chose to create an urban extrovert. This is a building that celebrates its place in Louisville, a convention center that uses its activity and presence to contribute to the vitality of downtown,” said Peter Ruggiero, design principal with HOK. On hand at the grand reopening event were Louisville Mayor Greg Fisher; Finance and Administration Cabinet Secretary William Landrum, III; Tourism, Arts, and Heritage Cabinet Secretary Don Parkinson; Louisville Tourism President and CEO Karen Williams; Stacey Church, KICC general manager; and KyVenues CEO David Beck, who moderated the reopening ceremony. During the two-year project, the western half of the building was redone to pave the way for a glass facade and new public circulation spaces to represent the building’s new extroverted personality. Other major updates include the addition of new main entrances on Fourth Street and a canopy with a color lighting display. Dynamic vertical oak wood paneling divides pre-function gathering spaces from the ballroom and serves as a nod to local distilleries and Kentucky’s famous bourbon trade. Additionally, Oak & Brew, a new hybrid morning and evening restaurant, has opened within the center, bringing local fare and Kentucky bourbon to visitors and show attendees. The center features a total of 200,125 square feet of exhibit space, a 40,000-square-foot ballroom, 52 meeting rooms and a 175-seat conference theater. Its new full-service kitchen can accommodate 15,000 meals per day. Retrofitted for the 21st century, KICC’s updated design reimagines the role of the convention center, and stands to further boost the economic revitalization of downtown Louisville. Featured rendering of redesigned KICC courtesy of Christopher Payne / Esto.